While the idea of a cross country cruise ship was pretty far fetched, the technology described seems to work. The Rolligon corporation is actually a going concern that makes big vehicles with really big rolligons. You’ll be riding on air â€” squashy bags of it that roll happily over every obstacle. 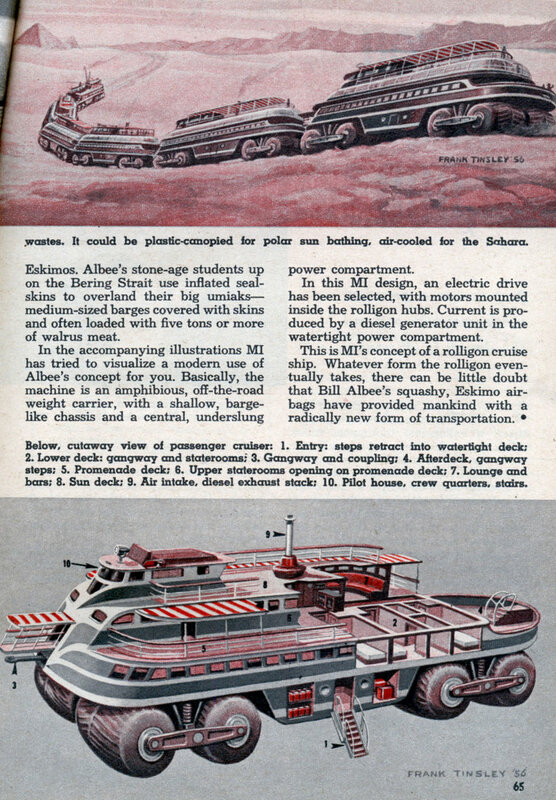 THE crazy, mixed-up amphibious train shown on this page, half bulldozer, half river boat and all Tom Swift, is only an adaptation of a vehicle now being operated experimentally by the Army. The rolligon wagon rolls slowly but implacably on a number of limp blimpsâ€”sausage-like air bags without much air in them. These saggy bladders are a vast improvement over the wheel when it comes to moving things over sand, muck, rocks and rubble. For several years the boating public has been using low-pressure rollers for moving boats on every type of ground. Rig your rowboat so that it rolls with the air bags instead of over them, put in some kind of power plant and you have a rolligon vehicle. The Army has done this; in fact, it has put a five-ton truck on rolligons and driven it where tractors fear to tread. Not only can you drive it easily over a field of king-size rocks but where other vehicles sink to the hub caps, this one rolls over muddy terrain with ponderous aplomb. The air bags spread the load so evenly you can drive your five-ton job over a bevy of sun-bathers with no more than appreciative grunts from the victims: servicemen and women who have tried it say it’s like a nice, beefy massage. The rolligon was made available to modern surface transport by an ex-mission school teacher named William H. Albee who learned about it from the Eskimos. Albee’s stone-age students up on the Bering Strait use inflated sealskins to overland their big umiaksâ€” medium-sized barges covered with skins and often loaded with five tons or more of walrus meat. In the accompanying illustrations MI has tried to visualize a modern use of Albee’s concept for you. Basically, the machine is an amphibious, off-the-road weight carrier, with a shallow, bargelike chassis and a central, underslung power compartment. In this MI design, an electric drive has been selected, with motors mounted inside the rolligon hubs. Current is produced by a diesel generator unit in the watertight power compartment. This is MI’s concept of a rolligon cruise ship. 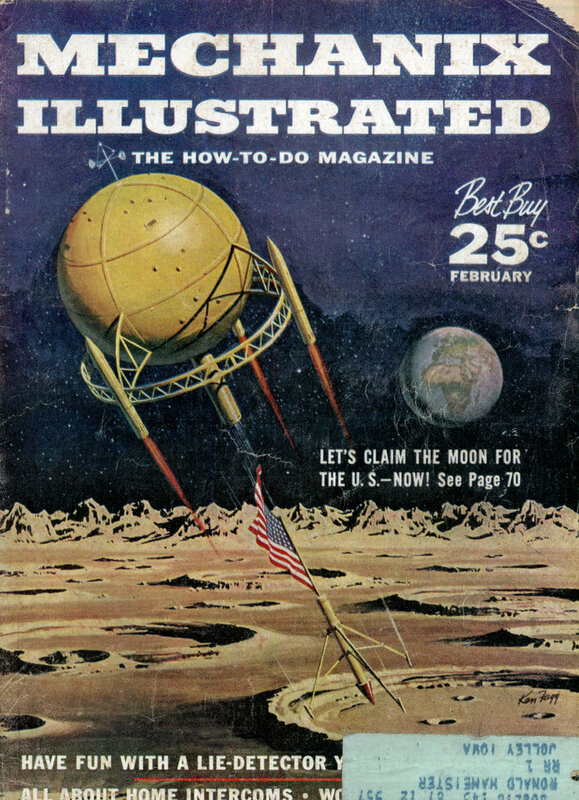 Whatever form the rolligon eventually takes, there can be little doubt that Bill Albee’s squashy, Eskimo air-bags have provided mankind with a radically new form of transportation. From the Atlantic to the Pacific, give every living thing in your pleasure-junketing path a beefy massage, thanks to modern cutting-edge Saggy Bladderâ„¢ technology. Ahh yes, the wonders of Saggy Bladder Technology. Is there nothing SBT cannot do? Err, or should that be anything? Wait, doesn’t that mean the same thing? Is there nothing SBT cannot do? Is there anything SBT cannot do? I was too hasty; Frank Tinsley has written it to perfection. Squashy bags, appreciative grunts, limp blimps…walrus meat?! I am not finished with the article and already I have 5 or 6 favorite new sentences in life. Charlie, let’s see the cover article! UPSing your flag to terra incognito doesn’t constitute a valid claim! Your regular readers must be on vacation. No one commmented on my “Life in a Spaceship” comment, despite it being clearly insane. I think no one commented because like me and, um everyone else on earth, they’ve never seen Becker. You’ll be happy to know that I have that cover article already queued up to go. I’ll post it tomorrow. For me, the “bargelike chassis and…underslung power compartment” is the phrase. I saw someting like that in TV. It was much smaller than this and used in the north(or south) pole. Uses same principles. Have 2 cars, big wheels. Can pass water or ice. Very interesting machine. I used to work for a construction company in Alaska and Canada and dealt with Rolligon Corp– yes they do make stuff like that. It’s used mostly for work in oil fields in Alaska or in other remote areas– can cross swamps, soft sand, and soft snow pretty easily, places a normal truck couldn’t go. Biggest thing they make is an amphibious 14×14 tractor trailer with a 50-ton payload. Fun to drive as long as you didn’t get seasick from the wobble, but could only go about 20mph, and you weren’t supposed to go on pavement because of how the tires were made. Frankly I think this idea is fascinating and I’m surprised that nothing like this has ever taken off. I think this article is pretty amazing and the Rolligon on the first page illustration looks like something you would see out of a 1960’s children’s futuristic dinosaur book. Sirscott – The whole idea of a Rolligon is that it doesn’t ruin the terrain that it passes over. Because the air cushion bags that the body and chassis are supported by distribute the load to have a impact less than a humans footprint. The problem would be crushing the vegetation, you would still need a path for this vehicle. Corey: Road trains exists. Anyway, just think of a “bouncy” ride in a back of a APC, and you’ll see, why such colossal land yacht/trains never saw a daylight.